Students created their own warmth during these cold temperatures when they took part in the annual Y7 Arts Festival. The Y7 students spent the day at the nearby Forest Arts Centre to get creative in many different art forms, focusing on the Danish word Hygge. Hygge (pronounced hue-guh) means to create a warm, cosy atmosphere and enjoy the good things in life. In drama, to create Hygge requires consciousness, slowness and the ability to not just be present – but recognise and enjoy the present. This atmosphere can come from something simple like a warm cosy fire, a cup of coffee, a good book or cosy jumper. To create this feeling the students took part in dance/movement and drama workshops. They also created a 30 second advert advertising Hygge, participated in an art workshop where they designed a card with drawings, shapes, lines and dots that contribute to that Hygge feel. 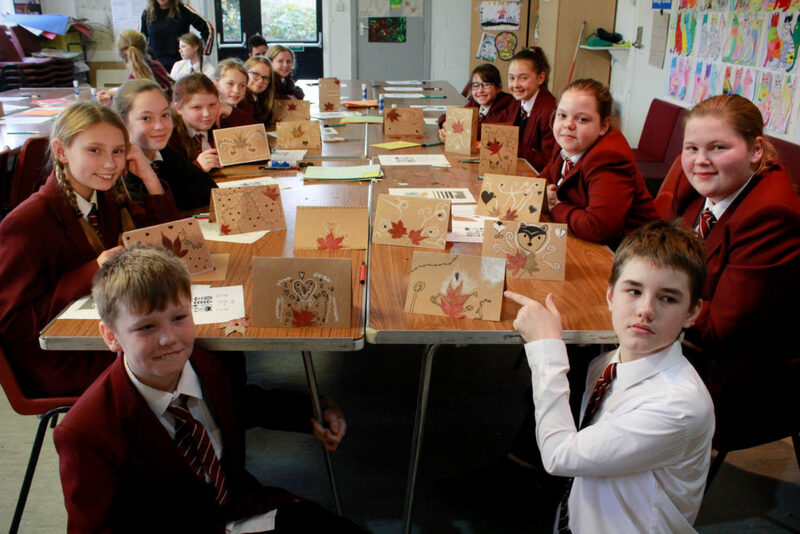 Helen Cundy, Director of The Forest Arts Centre, said: “Forest Arts was delighted to welcome year 7 students and give them a taste of the sort of activities that take place at the arts centre. “As a community arts centre, we want people of all ages to feel this is a place for them to take part, watch, be challenged, be creative and enjoy the arts. “The arts help develop the ability to think creatively, social skills, good communication, emotional intelligence as well as contributing to well-being and can lead to careers in the fast-growing creative industries.